fruit (nut?). It might help if you mentioned whereabouts in NZ you live. Good point, Mary. We live near Whakatane, in the Eastern Bay of Plenty. The climate is subtropical, but we get cold nights. Can we all assume we have a slightly different climate to everyone else, even just down the road? Fellow bloggers live from Auckland to Otago. I have heard that this season, frost was a problem for those down south and at high altitudes, while at times in the north we have barely had enough winter chilling to set flowers. From what I read when starting out on this venture, I had a fixed idea where walnuts would do well. Now, as a result of meeting other walnut growers, I realize that the trees will crop in a much wider area. The issues around growing them, however, will vary. Maybe this is a line we could explore in another blogletter. A few black walnut growers have joined in. Great! Although we will be focusing on nut production by European walnuts, we need to keep in mind we are growing timber as well whether we meant to or not, and it is possible to transform a liability at rotation-end into to an asset, by conscious management decisions along the way. Similarly, timber growers will be producing walnuts whether they mean to or not, and they can feed the rodent population or they can harvest the nuts. And that is the critical factor; what the kernels are like inside, when deciding whether blight is to blame. The husk sticking to the nut looks quite different when caused by drought. Blighty nuts have black husks. Husks sticking to the nut in a drought often have a bronze look, and can be separated cleanly from the nut. We find that this dried-on husk can be removed more easily after the nuts have been washed and the husk softens a bit. “I was disappointed with two things this year. A lot of the fallen nuts had their shell, fully or semi, still intact, which created a lot more work in the cleaning process. We have noticed that the time of leaf fall is dependant on the trees’ nutrient levels. This year we had less problems with leaves at harvest than last, I think, because we were more up to date with our fertilizer. What have other people found? I do also agree that dry weather can affect leaf fall. Tony is planning on applying more water mid season to delay leaf fall. Has anyone had experience of doing that? Although the questionnaire did not ask about varieties, many respondents did mention them. Not surprisingly, Rex and Meyric, (spelled many different ways) were the most common. I have heard complaint about Meyric dropping its leaves during harvest. Have any of you had this problem? If you have found the solution, or it has never been a problem, perhaps you could share your secret. Maureen Jacobs sent this beauty. Such a tidy scene makes me green with envy. Does everybody’s orchard look like this? How do you manage the orchard floor? Does this have to change once you start harvesting? What do you do with your prunings? My concern with a grass sward under my trees would be competition for water. I remember reading about forestry practice in South Australia, where they considered they had a weed problem if there was even one small grass plant within a metre of the tree because of competition for water. If you have ever dug postholes in dry weather, you certainly notice that the holes in a grass paddock are much drier that those dug in bare ground. With all the emphasis on irrigating in Canterbury, do people consider what the ground cover is? In thinking about what to blog about, I put down when I do things in the orchard/woodland, starting in winter. Winter – planting, sell nuts, weed spray. Autumn –harvest, prune, spread lime, thin out trees. If anyone has a different schedule than this, lets hear about it. Have I missed anything out? We do not do any mowing, so that is why it is not included. The next thing to think about is planting. 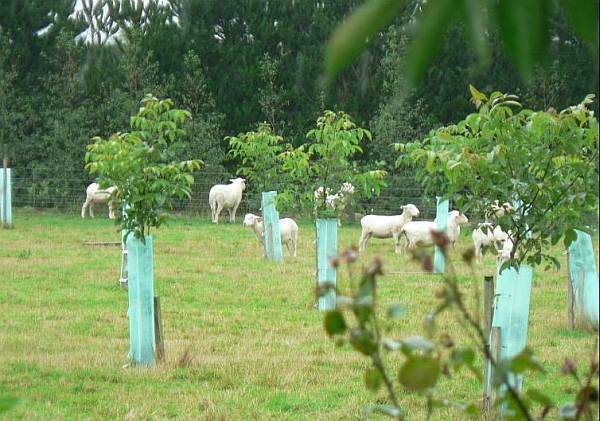 There are quite a few tricks to tree planting. You need to understand your soil. There is a really good article in the June 2010 Tree Cropper magazine by Reg Lewthwaite on planting on clay, which applies even more so to walnuts. Our soil is volcanic ash; lovely digging! But it is quite acid and short of phosphate. The method we have come up with, is to predig all the holes; a 50 cm deep posthole. Then we put in 400gm of both Superphosphate and lime, half in the hole and half on the soil to be backfilled. What do growers on other soils do? Do you dig out rocks, or shift the holes to one side to avoid them? A common theme is concern about handling future increasing crops. A number of us are handling current harvests, but what do we need to do to cope in future years? It would be good to share experiences. If you do it digitally (by finger and thumb), or use some expensive machine, let’s hear about it. This includes washing, grading and drying. Send us your pictures too, please. I am working on a way to have virtual fieldays. If I get enough photos we could have one of these fieldays on a particular topic rather than at one property as we normally have real fieldays. Washing, grading and/or drying would be good subjects; so would harvesting systems. Anyone interested in walnuts should check the following web sites from time to time.